This is the original sink from the house my great-grandparents built on the shore of Lake Erie in 1920. When I was a teenager my grandparents finally sold it, but not before they ripped out some original features to "update" the house. Can you imagine? It was a freaking tragedy. 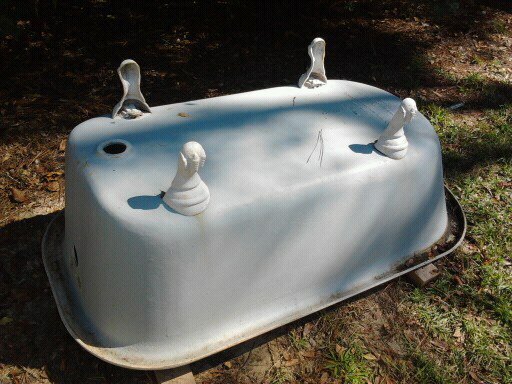 This is the other sink I ripped out of the beach shack before demo. It's not nearly as cool, it's probably from the 1960's. 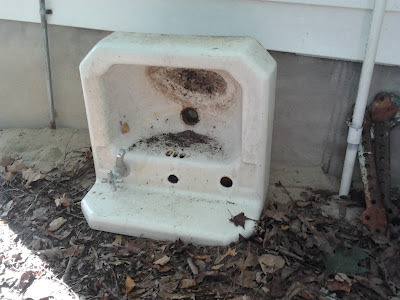 But I want to clean it up, get new faucets, and use it in the new house for the powder room. And the tub. Right now it's still sitting in my dad's garden, waiting. The architects freaked me out by telling me a story about these old clawfoot tubs having teensy hairline cracks or fissures, causing the tub to leak water out the sides! So they told me to make sure it holds water before I drag it down there and install it in the new bathroom! We need to get the word out and get you viral girl! You need your own design show... I know I have been telling you this for years but it is still so very true! Start making youtube vids for demos to put with these postings!! 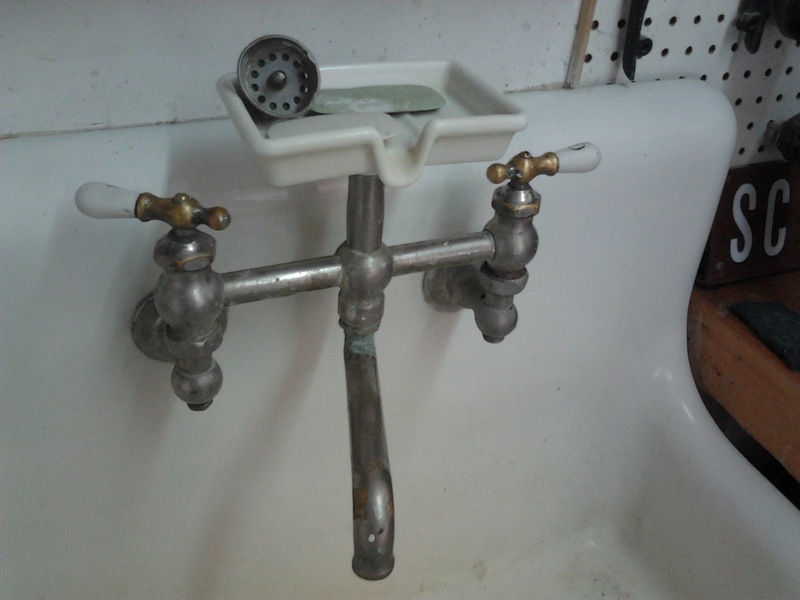 But maybe I will make videos of the auto paint process on these antique cast iron fixtures. That could be cool! A-ha! So this is the real reason you wrote earlier of buying a farm and joining the homestead movement! Keep dreaming my friend... you are going to have such sweet place when all is said and done! Love your tub. 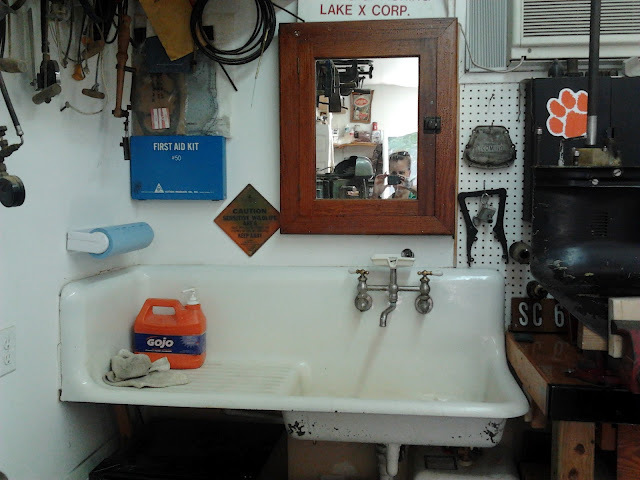 The sink in your Dad's workshop is amazing. I love the faucet too. Your salvaged sink will be perfect for a powder room! I found an awesome tutorial on shaker doors this morning for you. Here's the link. http://lumberjocks.com/kolwdwrkr/blog/12589 This guy goes into great detail. Cheers! I'm loving your blog. I'm going in reverse. I got excited when you mentioned the Upstate. I noticed the CU paw too. I'm loving your blog. I just stumbled upon it when I was looking for backsplash ideas. I have laminate and feel it is counterproductive to tile behind. Your blog is uplifting and really special since I noticed a bit about the Upstate and just noticed the CU magnet in the photo above. Really cool! I'm close. In the GSP area.